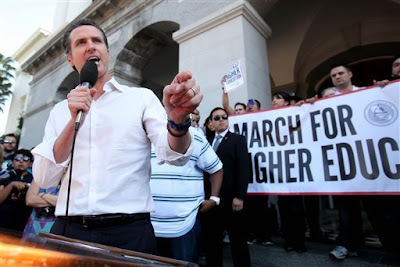 Occupy Movement protests planned for colleges nationwide attracted modest yet passionate crowds at California campuses on Thursday as participants decried state budget cuts to education and the resulting hikes in tuition. No arrests were reported around the state, and most academic schedules were not disrupted by the rallies. However, many classes at UC Santa Cruz were canceled as about 200 demonstrators blocked vehicle access to the campus. A motorist attempting to drive through the crowd struck several protesters, but no one was seriously injured, officials said. 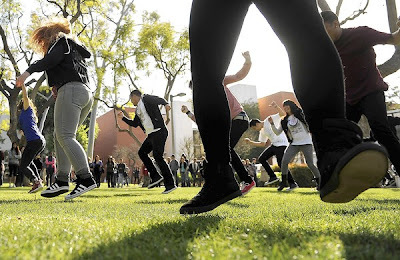 At one of the biggest rallies, several hundred students and faculty at Cal State Long Beach contended that the quality of education has declined even though tuition has spiraled upward. Dalia Hernandez said her scholarship is not enough to cover rising tuition and book costs. "It's frustrating trying to balance everything," said Hernandez, 22, a geography major. "Day in and day out, it's difficult to keep myself motivated." At Cal State L.A., about 300 students blew whistles and chanted "no cuts, no fees, education should be free." By the bookstore, the group hoisted signs that read "Stop Privatization" and "Defend Public Education." 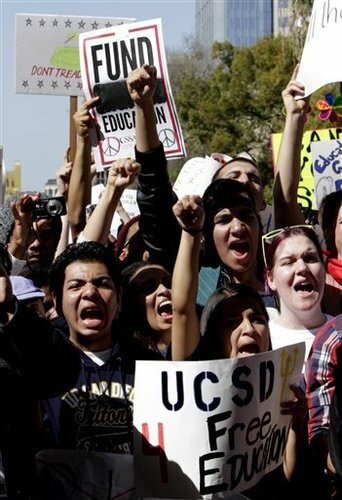 There were also protests at Cal State campuses in Fullerton, Dominguez Hills, Northridge, Bakersfield and San Francisco and UC campuses at Davis and Berkeley. 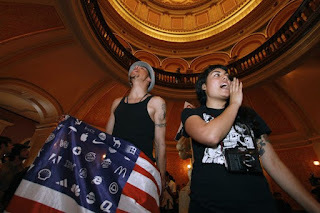 Related activities, some involving high school students, were planned in Austin, Texas, Boston, Chicago, New York and elsewhere. 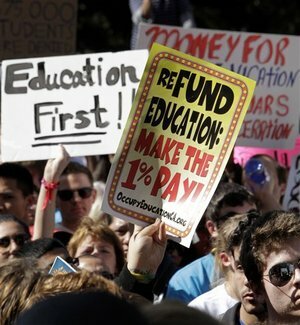 Organizers included unions, student coalitions, the ReFund California group and Occupy-related groups. Turnout was small at UCLA. Occupy protesters set up eight or so tents on Wilson Plaza, which the demonstrators said they renamed after Angela Davis, the politically radical professor who taught at UCLA. The group said they intended to keep the tents up through the night, and campus authorities said they were undecided if that would be allowed. School administrators clearly sought to avoid a repeat of the sort of confrontations that occurred at larger rallies in November — including the pepper-spraying of UC Davis students by campus police. That incident triggered a federal civil rights lawsuit and investigations about police tactics. Among the 20 or so demonstrators at UCLA on Thursday was Sergio Sorza, 20, a political science major who said he was upset about higher tuition, larger class sizes and fewer available courses. "We are not getting the same quality of education that UCLA promised us," said Sorza, a junior who said he was arrested in an earlier protest on campus. Nearby, other students who were not participating said they didn't like the Occupy movement's tactics. "It's not their message but the way they go about it," said Mark Rudnik, 21, a business economics major. Student leaders, some of whom did not endorse Thursday's rallies, said they hoped for a much bigger turnout Monday when the student government organizations of Cal State, UC and community colleges rally at the Capitol in Sacramento for more funding. 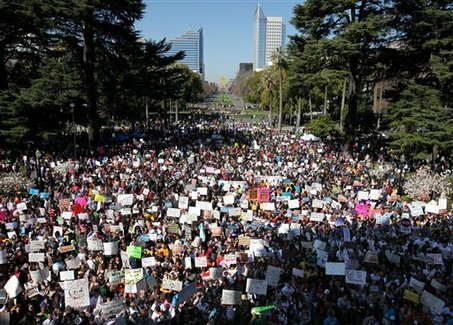 Some activists said they are aiming for 10,000, with busloads of students traveling from around California. At UC Santa Cruz, many classes were canceled in part because professors and students who live off-campus had trouble getting through the demonstrations, campus spokesman James Burns said. He said authorities did not attempt to open campus entrances through mass arrests. Meanwhile, the driver and a passenger in the car that struck the protesters were questioned by police but not arrested pending further investigation, Burns said. Rain in Northern California may have held down attendance. 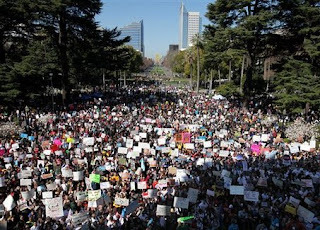 About 100 demonstrators began a march from UC Berkeley's Sproul Plaza toward Oakland, and some of them were later expected to join in a four-day "99 Mile March for Education and Social Justice" ending at Monday's Capitol rally, according to the Daily Californian student newspaper.